2nd December 2011: ITV1 national television- children program on technology. 16th March 2011: BBC1 television news report (click here to watch). 15th March 2011: ITV television news report . 8th March 2011: Kerstin Dautenhahn and Ben Robins appeared in a news report by Associated Press. (to watch click here). 7th March 2011: an article by the Associated Press was reported online by many news sites throughout the world. 22nd May 2009: The British Satellite News (BSN) reported the work with Kaspar and children with autism. 7th August 2008: the work with Kaspar and children with autism has been reported online by Bayerischer Rundfunk, a radio and TV-station in Germany. August 2007: an article in 'ZEIT Wissen' magazine - a bimonthly magazine of the German daily newspaper Die ZEIT, that covers scientific topics. 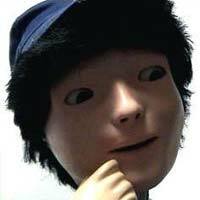 Schau Mir in Die Augen - article about the use of the Humanoid robot Kaspar with children with Autism. 5/2007, p 86-91. 30th May 2007: Ben Robins in a live interview on BBC World Service, BBC Radio 4, and BBC Three Counties radio stations. February 2002: An article about the Aurora project appeared in the French magazine "La Recherche"
31st October 2001: report on the Aurora project in the science section of the German weekly magazine "Die Zeit"
Kaspar was demonstrated by Dr. Ben Robins and Luke Wood during a two-day exhibition at the National Autistic Society conference on the 5th and 6th of March 2013. Dr Ben Robins also presented the work with Kaspar and children with autism in two lunch-time seminars at this conference. KASPAR was introduced to the Duke of Edinburgh by Dr. Ben Robins during an exhibition at the Stevenage Business & Technology Centre on 10th October 2012. http://www.106jack.com/news/local-news/duke-of-edinburgh-to-visit-stevenage-business-and-enteprise-centre. KASPAR was presented at the Science Museum Lates event on the 28th of November 2012. Dr Ben robins also gave a talk at this event presenting the work of the Aurora Project. Kaspar was demonstrated by Dr. Ben Robins and Luke Wood during a two-day exhibition at the National Autistic Society conference on the 8th and 29th of February 2012. Dr Ben Robins also presented the work with Kaspar and children with autism in two lunch-time seminars at this conference. KASPAR was on display amongst many other robots from around the world during the Robotville event in London at the science museum from the 1st to 4th of December 2011. Prof. Kerstin Dautenhan also gave a talk at this event. The event received international attention from many media groups around the world. Between October the 19th and 20th the adaptive systems research group presented both the KASPAR robot and the Sunflower robot at Naidex South 2011. August 2011 - KASPAR at the TAROS 2011 Conference, Sheffield. Dr. Kheng Lee Koay and Dr. Ze Ji exhibited the KASPAR and Sunflower robots at the TAROS 2011 conference from the 31st of August to the 2nd of September in Sheffield. The robots are used in the Roboskin project (KASPAR) and LIREC project (Sunflower). We presented KASPAR at the Autism Show, 24-25 June 2011, EXCeL London. On 24 November 2009 Dr. Farshid Amirabdollahian and Prof. Kerstin Dautenhahn organised a workshop in Ramada Jarvis Hotel entitled "Robots for Rehabilitation and Personal Independence" sponsored by KT-EQUAL. The event attracted more than 70 participants from UH Universities, Spain, Denmark, and the Netherlands. It was a very successful networking event for one of our key research areas, namely Social and Healthcare robotics.